Carolina is one of just two undefeated teams remaining in the NFL and quarterback Cam Newton is being considered for the MVP due to his outstanding play this season. Newton has always been a strong runner at quarterback, but this season his passing is much improved. The Cowboys now have Tony Romo back under center after missing 7 games, Dallas is four games under .500 but is still in the running to win the NFC East, trailing the New York Giants by just two games. 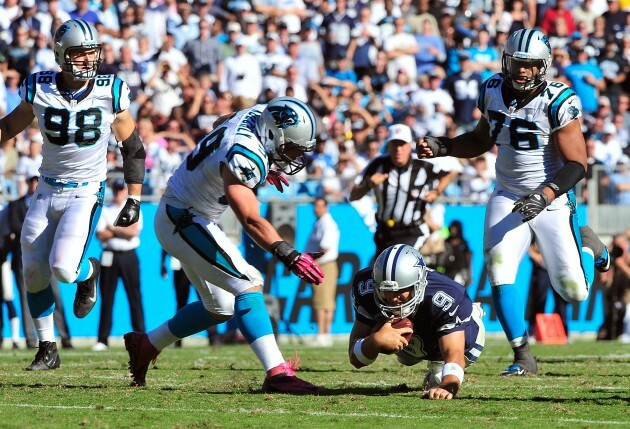 Tony Romo led Dallas to its first win in 8 games last weekend defeating Miami 24-14. Carolina beat two opponents in the NFC East – Washington and Philadelphia – handily and brings the league’s third highest scoring offense, but faces four of their next five games away from home. The Carolina defense, albeit not as strong as previous years, is rounding into form and has a strong front seven against the run. Greg Hardy the defensive end for Dallas will be facing his former team for just the first time since he left last offseason. Carolina will have its talented defensive end Charles Johnson activated to play and give Romo a hard time with his pass rush. Dallas will look to run the ball with Darren McFadden to take the early pressure off Romo and open passing lanes for him to hit Dez Bryant down field and Jason Witten over the middle. Dallas has won five straight games outright against Carolina. However, the two teams have not played head to head since October of 2012. This is probably one of those games that has a score of something like 7-6 after three quarters, as the two defenses battle it out. Can the Panthers keep Hardy off Newton? This is the game everyone circled when schedules were released in April. The return of Tony Romo makes it more interesting, but all eyes will be on the Cowboys defensive end. Romo remains one of the game’s great gunslingers. He’s never met a throwing window he didn’t think he could zip a pass through. That has led to plenty of late-game drama – good and bad. Matchup: UL-Monroe QB Garrett Smith vs. Texas State LB Damani Alexcee — Containing the Warhawks’ signal-caller will pose a challenge to Texas State’s struggling defense. The redshirt freshman from Spring Branch, Texas, has passed for 2,033 yards and 17 touchdowns and is second on the team in rushing with 359 yards. Alexcee will need a big game. 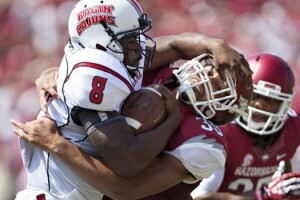 He leads the Bobcats with 70 tackles (56 solo). Players: UL-Monroe RB Ben Luckett — Leads the team in rushing with 373 yards and 6.2 average per carry despite not starting. The redshirt freshman from Palestine had an 85-yard touchdown run in the loss to Arkansas State; Texas State S Stephan Johnson — The sophomore’s two interceptions against Georgia State were the first two picks of the season for the Bobcats, who will need more of the same against UL-Monroe. 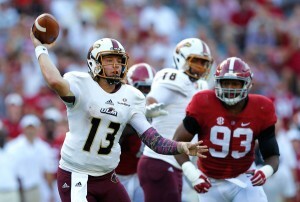 The Louisiana Monroe Warhawks look to get their second win and snap a seven road game losing streak. Garrett Smith is completing 57.2 percent of his passes for 2,033 yards, 17 touchdowns and 11 interceptions. Smith has five touchdown passes in his last three games. Ajalen Holley and Marcus Green have combined for 1,127 receiving yards and 10 touchdowns while Rashon Ceaser has 31 receptions. The Louisiana Monroe Warhawks ground game is averaging 103.4 yards per contest, and Ben Luckett leads the way with 358 yards and two touchdowns Defensively, Louisiana Monroe is allowing 39.6 points and 440.9 yards per game. Hunter Kissinger leads the Warhawks with 92 tackles, Tre’ Hunter has two interceptions and Ben Banogu has four sacks. Brady Willcut, Brandon Bridgers and Cody Robinson are questionable. The Texas State Bobcats look for their third home win to snap a three-game losing streak. Tyler Jones is completing 58.6 percent of his passes for 1,900 yards, 10 touchdowns and eight interceptions. Jones has three passing touchdowns in his last three games. Jafus Gaines and C.J. Best have combined for 784 receiving yards and two touchdowns while Brandon Smith has 21 receptions. The Texas State Bobcats ground game is averaging 193.8 yards per contest, and Robert Lowe leads the way with 805 yards and seven touchdowns. Defensively, Texas State is allowing 41.6 points and 559.8 yards per game. Damani Alexcee leads the Bobcats with 70 tackles, Stephan Johnson has two interceptions and Marcus Dallas, Jr. has two sacks. The Warhawks are 5-2-1 ATS in their last 8 games in November and 1-5-1 ATS in their last 7 games overall. The Bobcats are 5-2 ATS in their last 7 games in November and 1-6 ATS in their last 7 games overall. Start Time: 7:00 PM EST. Friday, October 30. Line: East Carolina -7.5. Over/Under: 50.5. 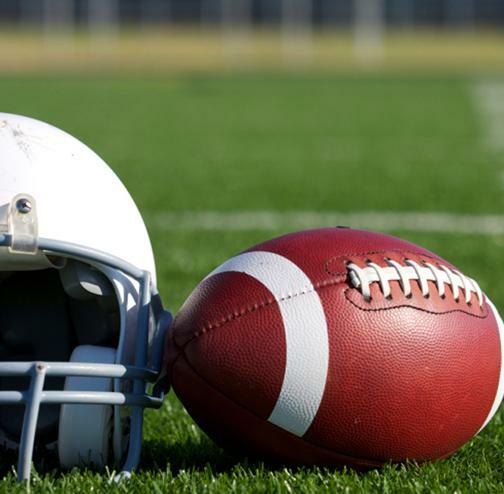 The Eastern Carolina Pirates will travel to Rentschler Field to take on the Connecticut Huskies this Friday night in College Football action. The Eastern Carolina Pirates couldn’t hold on to a 14-10 4th quarter lead and dropped to 4-4 (2-2 American East) on the season after being defeated by the 22nd ranked Temple Owls, 24-14, this past Thursday. The Pirates were able to outgain the Owls by a 378-322 margin however committed two turnovers and allowed Temple to block a key punt late in the 4th that led to game clinching TD for the Owls. Leading the way for the Pirates was WR Isaiah Jones who had 106 yards on 10 receptions in the loss. 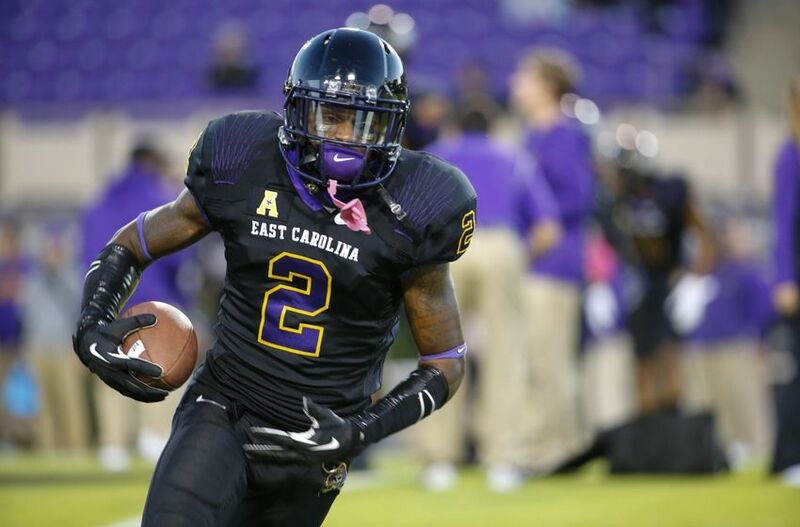 On the season, Eastern Carolina is averaging 29.9 ppg on 426.0 yards per game (286.3 passing, 139.8 rushing). The Pirates have used two QB’s throughout the season as they have a throwing QB in Blake Kemp (70.1 comp %, 1828 yards, 11 TD, 7 INT) and a duel-threat QB in James Summers (Throwing: 66.7 comp %, 428 yards, 4 TD, 1 INT, Rushing: 60 carries, 383 yards, 6 TD). RB Chris Harrison is the main threat in the backfield and currently has 525 yards and 7 TD on 119 carries. Eastern Carolina has a solid receiving core that is led by WR Isaiah Jones (61 receptions, 701 yards, 3 TD), TE Bryce Williams (38 receptions, 400 yards, 3 TD) and WR Trevon Brown (25 receptions, 341 yards, 3 TD). Defensively, Eastern Carolina is allowing their opponents to average 29.1 ppg on 413.3 yards per game (241.5 passing, 171.8 rushing). The Pirates have had trouble with turnovers as they’ve committed 15 turnovers on the season and have a turnover margin of minus 6. Leading the way for the defense has been LB Zeek Bigger who has 65 tackles and 1.5 sacks. The Connecticut Huskies had trouble stopping the high-powered Cincinnati offense and dropped to 3-5 (1-3 American East) on the season after being defeated 37-13 by the Bearcats this past Saturday. The Huskies were outgained by an incredible 612-266 margin and committed two turnovers in the loss. QB Bryant Shirreffs struggled throwing the ball as he completed just 12 of 27 passes for 87 yards and a INT however did lead the way for the Huskies as he was able to rush for 90 yards on 17 carries. On the season, the Huskies have had trouble finding ways to put points on the board as they are averaging just 19.0 ppg on 342.1 yards per game (221.6 passing, 120.5 rushing). Leading the way for the offensive has been RB duo of Arkeel Newsome (83 carries, 412 yards, 4 TD; 33 receptions, 345 yards, 2 TD) and Ron Johnson (70 carries, 150 yards, 4 TD). QB Bryant Shirreffs has completed 62.0% of his passes for 1723 yards, 7 TD and 5 INT while rushing for 342 yards and 2 TD on 113 carries. Noel Thomas is the leading receiver for the Huskies as he has 493 yards and a TD on 37 receptions. Defensively, Connecticut is holding their opponents to 22.1 ppg on 388.5 yards per game (204.0 passing, 184.5 rushing). The Huskies currently have a plus 5 turnover margin and have been led defensively by DB Jhavon Williams (37 tackles, 3 INT) and DB Andrew Adams (65 tackles, 2 INT). The Pirates are 13-4 ATS in their last 17 games following a S.U. loss however, just 2-10 ATS in their last 12 conference games. The Huskies are 2-5 ATS in their last 7 Friday games however, just 1-5 ATS in their last 6 home games. The Pirate offense was derailed by Temple, but it was just a brief detour. And now that the Huskies have begun showing cracks on D, yielding 612 yards to Cincinnati on Saturday, ECU is poised to get back on track. The staff has done a nice job of mixing the quarterbacks, passer Blake Kemp and runner James Summers, and the skill talent is much more diverse than it is at UConn. Sure, the Huskies are a one-note, spotty offense that relies too heavily on QB Bryant Shirreffs. However, the Pirates have been anything but consistent on defense through the first eight games. It’s a beatable unit that’s going to be challenged by not only Shirreffs, but also RB Arkeel Newsome and WR Noel Thomas. Summers took a backseat to Kemp last week because of how difficult it is to run on the Owls. But the Huskies are giving up more than 4.7 yards per carry, while being gashed the last two weekends. The Pirates will want to unleash the shiftiness of Summers, while also giving more touches to backs Chris Hairston and Anthony Scott. From College Football, Casino Betting, Racebook Gambling, WagerWeb offers you the best online gambling options, check it now! The Arkansas State Red Wolves looked dead in the water before a pick six and fumble recovery for another TD led the way to a 49-31 victory at South Alabama. ASU led 345-302 in yardage and forced a whopping five turnovers to win going away. The return of quarterback Fredi Knighten gave the Red Wolves a lift as he completed 10-17 for 119 yards and a pair of touchdowns with Tres Houston snagging three balls for 59 and a score. Warren Wand was the best Arkansas State rushing option with 85 yards on 14 touches while Johnston White totaled 46 yards on nine carries with a pair of trips to the end zone. The under is 4-0 in Ragin’ Cajuns last 4 games after allowing more than 280 yards passing in their previous game and the Ragin’ Cajuns are 4-0 ATS in their last 4 Tuesday games while the under is 7-1 in Ragin’ Cajuns last 8 games on fieldturf. The over is 4-0 in Red Wolves last 4 home games vs. a team with a losing road record and the Red Wolves are 0-4 ATS in their last 4 games after scoring more than 40 points in their previous game while the over is 6-0 in Red Wolves last 6 vs. a team with a losing record. The Ragin’ Cajuns are 6-1 ATS in their last 7 meetings and the underdog is 4-1 ATS in their last 5 meetings while the Ragin’ Cajuns are 4-1 ATS in their last 5 meetings in Arkansas State. 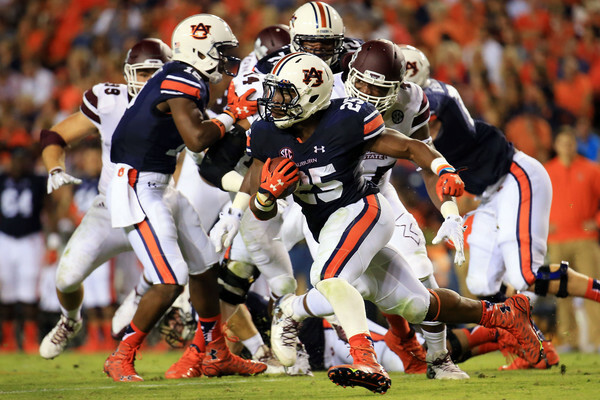 The Auburn Tigers travel to Lexington to face the Kentucky Wildcats tonight. Auburn is in the midst of a disappointing season, while Kentucky’s 4-1 record is both a sign of improvement but also a bit of a paper tiger. This pivotal game serves as potential gateways to the second half of the season for both squads. A loss for Auburn will ramp up negative recruiting talking points and could impact player buy-in entering a tough four game stretch. However, Kentucky will be Auburn’s easiest opponent for the next month, and getting a win now will pad Auburn’s current 3-2 record before entering that grinding maw. Kentucky has not hosted a Thursday football game in 76 years, so Wildcats players have had their nationally televised matchup with Auburn circled on their calendars for a while now. While Kentucky had a weekend off to get ready the Southeastern Conference showdown, the Wildcats (4-1, 2-1 SEC) haven’t beaten the Tigers (3-2, 0-2) at home since 1966. After upsetting then-No. 25 Missouri last month, Kentucky players believe this game can help define the program’s quest for respectability. The Wildcats’ challenge is avoiding stage fright against an Auburn program unexpectedly facing urgency. Thursday’s result will also direct Kentucky through one of two gateways, although both have rosier overtones compared to the path Auburn would travel with a loss. A win moves UK to five wins and almost certainly assures a post-season berth with lowly Charlotte remaining on the schedule; but importantly, a win against Auburn also opens the realm of possibility for more than six wins. That would cement a three-year reclamation project and make Mark Stoops a candidate for higher profile coaching jobs. A win would also keep Kentucky in the middle of the hunt for the SEC East crown. A loss on the other hand wouldn’t be damning, but the margins will get a bit tighter going forward. The ‘Cats would also miss out on the opportunity to beat a prestigious opponent on a night when they’ll be the main college football game on TV. The Tigers have dominated this series 25-6-1 and won eight straight in Lexington, including a 37-34 victory in 2010. That was the last season the Wildcats went to a bowl game, and they’ve made it clear their goal is getting back to postseason. It used to be, up until 1996, that if teams finished in regulation with the same score, it was a tie. Nobody likes a tie. Unlike the current NFL overtime rules, the college system mandates that each team gets an opportunity to score at least once. Kickoffs are eliminated as each team begins its possession on the 25-yard line – immediately in field goal range with a competent kicker. If a tie remains after the first overtime, another overtime period is added until a winner is determined. From College Football Betting, Casino Betting, Racebook Gambling, WagerWeb offers you the best online gambling options, check it now! The NFL’s system is to play an additional 15-minute quarter of actual football, with kicks, punts, extra points, safeties, defensive touchdowns and everything. Whoever is ahead after that wins, and if it’s still tied it’s just a tie. The overtime rules were an instant sensation. In its first season in effect, Cal and Arizona played in a four-overtime, 56-55, thriller. Three games reached seven overtimes in later years, forcing an amendment in an effort to shorten these games. Now teams must go for two after scoring a touchdown in the third overtime or later. The overtime period begins with the coin toss to see who gets possession or who defends their goal first. 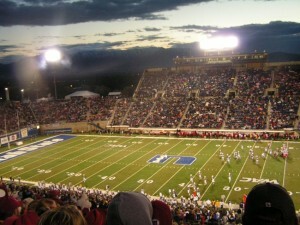 Unlike the sudden death form of overtime in the NFL, college football’s overtime allows each team the chance to have possession. There is no game clock in overtime at the college level, just the normal play clock. Once the first teams possession is over the second team gets possession and follows the same format. If the first team scored a touchdown and an extra point, then the second team must do so in order for the overtime period to continue. If not the game is over when the second team losses possession. If both teams score the same amount of points, whether by touchdown or field goal, then a second round of overtime is played following another coin toss. If a third overtime is needed, then teams are forced to convert a 2-point conversion following a touchdown. They cannot kick an extra point. The one and only way for the overtime period to end without one team getting possession is if the first team turns the ball over and the defense is able to convert a touchdown on the turnover. Otherwise, each team is afforded the same number of possessions. This form of overtime has seen its critics as offensively minded teams have a much higher chance of winning. Playing inside the 25-yard line of your opponent is a difficult task, as the field becomes smaller and open spaces fewer. Therefore, teams that are used to controlling the clock and pushing the ball forward tend to be more successful in OT at the college level. The most traditional of all bets. This wager consists of picking either the favorite or the underdog to cover the spread. If you take the favorite, you subtract points from your score to determine the winner. If you select the underdog, you add those points to your final score and compare it to that of the favorite’s to determine if you covered the bet. A Moneyline (ML) takes the spread out of the equation as bettors simply pick who they think will win the game. Different odds placed next to each team will quantify the payout of betting on either team. From Online Sportsbook, Casino Betting, Racebook Gambling, WagerWeb offers you the online gambling option. This wager has nothign to do with the point spread or which team wins the bet. Instead, your betting on the total points scored by both teams. It should be noted that you should learn to focus on such bets because they are the easiest bets to beat in college football betting. Every major U.S. sport is broken down into division, whether it is quarters, halftimes, periods, or innings. Naturally, the bookmakers have made available wagers for these partitions, and for NCAA football, they are known as the 1st quarter and Halftime lines. As one might expect, the 1st quarter line is generally a quarter of the entire game’s line, while the first half line is usually about half of the entire spread. These lines are available at all reputable sportsbooks. Halftime wagers are only available during halftime of the contest. Our Sportsbook Insider software helps bettors track how the halftime lines and halftime betting percentages fluctuate during the small window that is halftime. Parlay wagers consist of the bettor selection in between 2-12 teams, which can be sides or totals, in which all selections made must cover their spread in order for the betting ticket to be deemed a winner. If one game loses, your ticket is garbage. This wager is very similar to the parlay in that you have to take 2 or more teams and they all have to win. The difference is that you get to move the point spread in your favor. The amount of points you get to move the spread by is all up to you as your sportsbook will give you numerous options. It’s a combination of a parlay and a teaser with a serious tweak to it. It’s like a parlay in that you have to take 2 or more teams and they all have to win to cover the bet. It’s like a teaser in that your moving the point spread, but the tweak is that your moving it AWAY from being in your favor. These bets have insanely high payouts for very good reason, their tough to beat! Prop bets are considered “fun” bets by many but the astute bettor feasts on these wagers because he has an eye for the sucker bet and he is statistically astute and moves on these bets when they are in his favor. If your a novice, their fun to play but you need to follow a rule of thumb so you don’t get waxed: “If it looks too good to be true, it probably is! As crazy as it sounds, sometimes it’s best to fade your own gut feeling/opinion and go the other way when faced with such a bet. These are bets in which you make a pick on which team you think will win their division, conference or championship before the season starts. Often times the risked amount is very small with a very large payout should you correctly select the winner of the wager. These bets can also consist of over/under team wins during the course of the regular season amongst many other things. The Louisville Cardinals are off to an 0-2 start to the 2015 season both straight up and against the spread, and they’re also just 3-2 SU and 0-5 ATS in their last five home games. 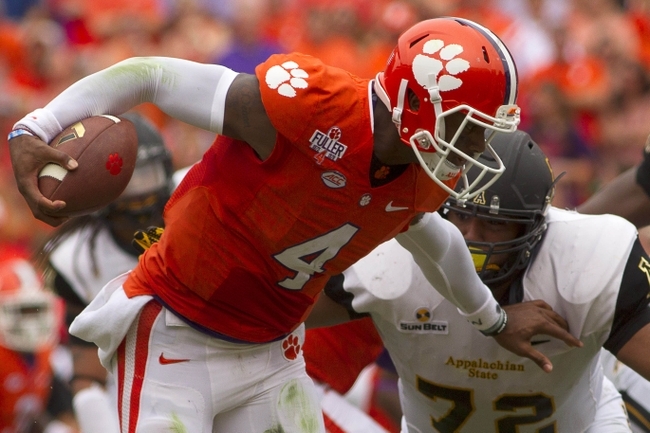 Meanwhile, Clemson owns a four-game winning streak both SUand versus the numbers. Louisville has started 0-2, taking on Clemson only makes the start of the season more difficult. The Cardinals put up a pretty good fourth quarter fight in their season-opening loss to Auburn and that looked like it would carry over to their home opener against Houston. It didn’t as the Cougars improved to 2-0 with a 34-31 win over Louisville, scoring 17 fourth quarter points to send Louisville to an 0-2 record. Clemson looks like a potential national title contender this season, but it’s worth noting they’ve played Wofford and Appalachian State. Dabo Sweeney has had some excellent teams in Death Valley but the schedule has always ended up with a landmine or two. One of those games comes after the Louisville one as the Tigers host Notre Dame. This game opened as a pick em, but with Louisville’s struggles this season Clemson has quickly taken a lot of attention. Quarterback Deshaun Watson has thrown for five touchdowns and just one pick so far in the two games and he’s poised for another big game in this one against a stingy Louisville defense. That defense has been beaten up through their first two games and Clemson might be the best offensive team between the three schools, which certainly gives an advantage for the Tigers in this one. While Louisville will get quite a bit of attention as a touchdown underdog at home when they are in a must-win situation, this is a bad spot for them. The Southern Utah Thunderbirds who made an appearance in the FCS playoffs in 2013 didn’t repeat the their success last year as they were able to go only 3-9 on the season and 3-5 in conference (Big Sky) play. If Southern Utah is going show improvement this year it will need to come from their defense who struggled last year giving up 35+ points in over half their games played. The good news for the Thunderbirds is that they do have Big Sky Preseason Defensive MVP in DE James Cowser. The Thunderbirds will also be hoping that defensive backs LeShaun Sims and Miles Killebrew will be able to help Cowser and prevent some of the big plays that hurt them last year. On the offensive side of the ball, Southern Utah is hoping the former BYU transfer Ammon Olsen (241-381, 3049 yds and 21 TDs) can continue the strong showing he put together last season. Southern Utah has some talent on this team and if they can find some additional weapons on offensive, this team could be a threat to some of the top teams of the Big Sky conference. The Utah State Aggies finished last season with a 10-4 record and 6-2 conference and earned a trip to the New Mexico Bowl in which they beat UTEP 21-6. The Aggies were able to overcome injuries to their top two quarterbacks last season (Chuckie Keeton and Darrell Garretson) and with Chuckie Keeton ( 1st team WAC in 2012) can return to form and avoid injury, the Aggies will be a threat to Boise State in the Mountain West this season. Utah State has a strong and experienced offensive line that should help provide Garretson some protection and have a great wide receiver in Hunter Sharp who finished last season with 66 receptions, 939 yds, and 7 TD’s. On the defensive side of the ball Utah State is returning 6 starters that led the Mountain West conference in 2014 in conference ppg (18.4). The Aggies are stacked at the LB and DB position and are led by LB’s Nick Vigil and Kyler Fackrell. The Thunderbirds are 4-1 ATS in their last 5 vs. MWC and 6-2 ATS in their last 8 games in September. The Aggies are 8-3-1 ATS in their last 12 games in September. We want out clients to enjoy the different bonus that we offer, for this you need to know our bonus rules. – It is the player’s responsibility to request a bonus at the time of the deposit. If the player deposits and makes a wager prior to requesting a bonus the player will have to wait until he makes his next deposit in order to get a bonus. – Bonuses will only be awarded to account holders who provide a verified name, street address and phone number. – New accounts that receive a bonus agree to leave the initial deposit and fees in the account for 30 days. However if any required rollover has been completed, the winnings may be withdrawn. Winnings are the monies in the account in excess of the money deposited including the fees. – All WAGERWEB promotions can be used only one time per household. 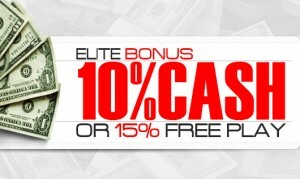 – In order to qualify for any bonuses, the minimum deposit must be $100.00. The bonus must be requested at the time of the deposit. – WAGERWEB promotions cannot be combined. – Bonuses are intended for recreational bettors only for use in the sportsbook. We reserve the right to adjust or rescind bonuses given to players playing principally in the casino. Professional players, syndicate players, or players considered by WAGERWEB to be abusing the bonus system by any means may have their bonuses, and the money won from these bonuses, revoked at the discretion of WAGERWEB management. Call our office for a detailed explanation of what is considered bonus abuse. – Any violations of the rules in any offer(s) of WAGERWEB can result in the immediate forfeiture of all bonus funds, and the winnings from the use of these funds as well as the loss of account holder privileges. – If it is determined that a new customer already has an account with WAGERWEB, thus abusing our bonus system, WAGERWEB may require the forfeiture of all bonuses and the money won from said bonuses. – WAGERWEB reserves the right to terminate or modify any bonus program at any time. Participants agree that prior notice of a modification or termination is not required and no bonus will be paid past the termination or modification date. – WAGERWEB reserves the right to charge an Account Closure Fee to any account deemed by WAGERWEB to be a professional, syndicate, non-recreational, or bonus abuser. The Account Closure Fee may vary depending on the case. – All clients who receive a bonus must complete their rollover requirement prior to a withdrawal request. The rollover is the amount of times a client must play the total amount of the deposit plus reimbursed fees and bonus. The rollover can only be completed with sportsbook volume. WagerWeb does not cover fees if the deposit and fee amount is not left in the account for 7 days (this is the 7 Day fee Rule). For example, if you have a five time rollover (5X) and you had sent us $1000.00 with a reimbursed fee of $68.00 and a cash bonus of $100.00, you must complete $5840.00 ($1000 + $68 + $100 X 5 = $5840) in total sports book volume before you can request a withdrawal of your funds. Sportsbook Volume is defined at WAGERWEB as the lesser of the risk or win amount of each wager. Casino, poker, and free play volume do not count towards this rollover. If the client chooses to withdraw funds from the account before these requirements are fulfilled, all bonuses, fees and winnings from these monies can be forfeited and deducted from the account balance. Winnings will be determined at the sole discretion of WAGERWEB. Acceptance of any bonus from WAGERWEB is considered an agreement to this policy. Betting both sides of the same game to accelerate the rollover process is considered a violation of our bonus rules. Any wagers placed on both sides will be excluded from the rollover calculations. – Once all rollover requirements have been met, payouts can be arranged through a number of different methods. All withdrawals must be sent in the account holder’s name. – Free Play wagers can be placed over the phone and on the Internet for straight wagers and two or three team parlays or teasers. 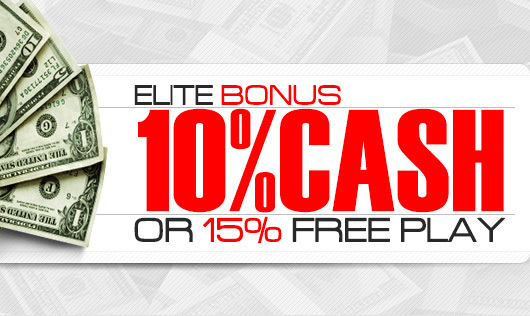 Free play bonuses may be used on any type of wager, including parlays or teasers with a maximum of three teams. If the play wins, then only the winnings go into the players account as CASH. If the FREE PLAY loses there is no physical adjustment to the account. If the play ends in a push then the player gets to play the free play again. Example 1: A client has a $100.00 free play and wishes to use it on the Dallas Cowboys -3 (-110). The wager will be $0.00 to win $91.00. The client lays the virtual $100.00 to win $91.00. Example 2: A client has a $100.00 free play and wishes to use it on the Atlanta Braves -140. The wager will be $0.00 to win $71.00. The client lays the virtual $100.00 to win $71.00. Example 3: A client has a $100.00 free play and wishes to make a 3 team football parlay. Our 3 team football parlay odds are 6 to 1. The client lays the virtual $100.00 to win $600.00. Example 4: A client has a $100.00 free play and wishes to make a 3 team 6 point teaser. The client lays the virtual $100.00 to win $180.00. – Bonuses are given to our recreational players with the rollovers calculated using ‘normal’ play. If a player receives a bonus and 50% or more of the player’s action is on baseball, the rollover will be doubled. – If you do not break a deposit on which you received a bonus into at least three relatively equal wagers, the bonus and any winnings can be rescinded. – Acceptance of any bonus offered by WAGERWEB constitutes agreement to the conditions applicable with each offering. If you are unclear or require further clarification, contact our Client Service Department prior to accepting and/or making use of any bonus. – All new accounts are subject to a period of review, and during this time, they may not be eligible to participate in specific promotions offered by WAGERWEB. It is the member’s responsibility to question and clarify any event not covered or rules he/she does not understand prior to placing any wagers.